One of the greatest tricks a ranger can pull off is to find a chameleon at night with a spotlight. It was our guests’ second night with us, and we had yet to see a leopard. We had just finished enjoying sundowners while watching the sun set behind the great Drakensberg mountain range, and decided to head out and see what the night held in store for us. The wind had picked up, and there wasn’t much going on as most of the animals had sought cover from the elements. 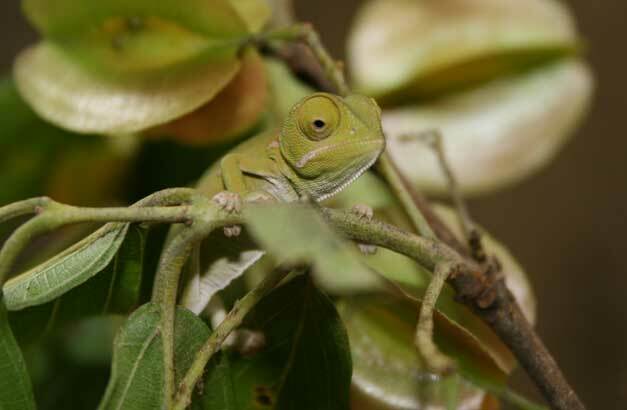 Just when we thought we were going to have to admit defeat and call it a night, we spotted a Flap-necked chameleon in a tree close to the road. It proved to be an awesome sighting, with the little fellow waking up and giving us the beady eye. The guests were suitably impressed with the discovery, and the following morning we were rewarded with an incredible leopard sighting. All’s well that ends well. We set out early one morning to see what we could find. The elements all conspired to provide the perfect setting for a game drive, and the day looked set to be a wonderful one. Our first stop was an open area near the camp where giraffe and zebra are known to hang out, and we were lucky enough to find both. 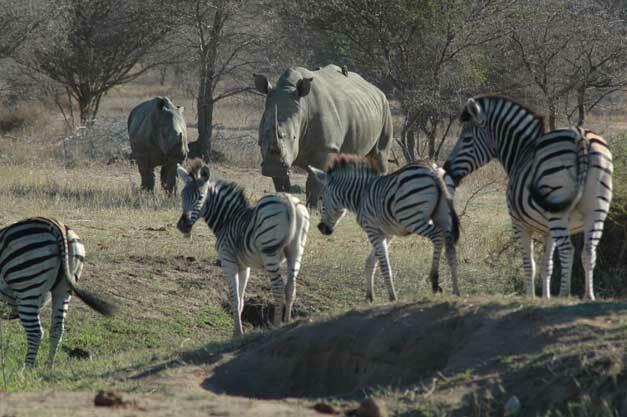 The guests were thrilled, but our good fortune didn’t stop there, as white rhino and her calf appeared out of the blue to join the zebra. Because vegetation is abundant, it’s not often that you’ll find different herbivore species grazing together. It was an awesome sighting none the less, and well enjoyed by all.